Many longtime Windows users have grown to rely on the Notepad app for it’s plain text editing simplicity, for everything from writing little code blocks to just serving as a easy way to strip formatting and styling from anything copied into an open Notepad document. As a result, many Windows switchers to the Mac platform look for something that behaves similar to Notepad, but it turns out that such an app already exists in OS X and thus there is no need to download a third party app for most basic Notepad-like needs. Instead, just make a quick settings change to the TextEdit app that ships with every version of Mac OS X to turn it into a plain text editor. 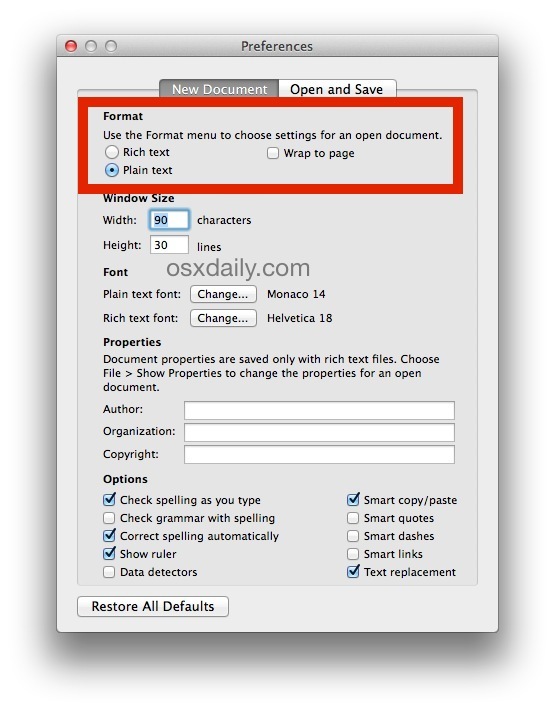 That’s it, now anytime you hit Command+N or launch a new TextEdit file, it will default to be a plain text file. It also simplifies the TextEdit appearance a bit by removing the formatting option buttons across the top of an open file window. That also means anything pasted into a new empty TextEdit file will have formatting pulled out automatically, without having to use any of the tricks to strip the styling from pasted text, and without having to convert an existing RTF to a plain old TeXT from the menu options. TextEdit is really an under appreciated an unloved app in OS X, and it can serve many more functions than people give it credit for, able to function as a basic word processor, quick outliner, even working as a decent HTML source viewer that’s light weight. Of course, for any advanced text editing needs, you’ll want to step up to an app like TextWrangler or BBEdit, two excellent choices for code and raw text editing, or an app like Pages or Word for word processing and report creation. Notepad is about the first thing to get superceded on any Windows box I use. Notepad++ is far better and more versatile. Perhaps selecting the OSX App that is closest to this might be a better article. Indeed, Notepad++ is great on Windows. My preference on a Mac is TextWrangler and BBEdit, but I use TextEdit for a lot of basic tasks and find that it works well for simple text, writing, and word requirements. +1000000000 on TextWrangler ;-) is a great application! Simply the BEST free plain text editor in the Mac world…. Text Edit in plain text mode works totally fine for me, but then everyone has their own needs. 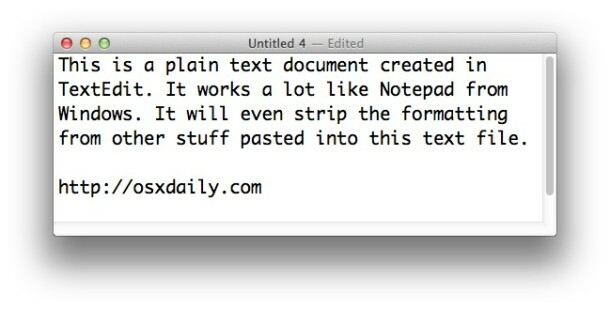 What’s really bad is that OS X Daily compared Text Edit to Notepad. That’s just wrong. And what’s with the older screen shot? OS X Daily has been using Yosemite screenshots since before it was released. I’m offended. The plain text handling of Notepad (and in this case, TextEdit) is highly desirable for many users. Regarding the screen shots showing the older user interface, I run OS X Mavericks and OS X Yosemite because they are the two most popular versions of Mac OS around at the moment, this specific article (and most others) apply to most versions though. I have yet to brave it so for now TextWrangler seems to do the trick. I commonly swap Word file and other documents and email content between my PC and Mac at work. 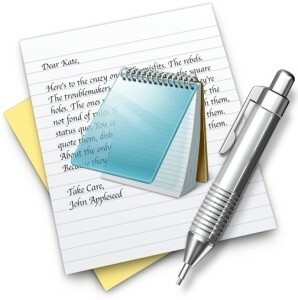 Notepad and TextEdit are my two go too programs I use to strip formatting. One problem I encounter often is apostrophes, quotes and other punctuation sometimes come across as jibberish characters. I’m not sure why when it’s just plain text. On the PC I use Notepad to strip formating before bringing it into SharePoint which is a nightmare when pasting in formated content. I find the default Curly Quotes style in OS X to be annoying as it renders as improperly either as squares or jibberish (and it’s a particular mess if you have to write or edit code as it gets replaced erroneously with the wrong syntax). As a result, it’s one of the first things I change on any Mac. Give it a try, it may help resolve your issue. Why on earth would you want to introduce Windows based ideas into a Mac? Totally different platforms…we don’t want anything Windows on our Macs. If you’ve got a Mac…learn to use it and its programs, otherwise go back to your PC. You should read the article, it explains why TextEdit can be a reasonable alternative to NotePad and why that would be desirable. The article is before the comments section. Thanks for the info about changing to Plain Text. I’ve often used TextEdit since moving to Mac, but never understood why it behaved differently than Note (I mean, I assumed they would be very, very similar). This makes things better by far. I find the default font sizes (14) are way too small on my 17″ MBP, so I make them at least 18, if not 24. There’so a key press to switch between rich and plain text in TextEdit, though I don’t have a Mac in front of me at the moment to look it up. Also, TextEdit doesn’t have file size limitations that Notepad did (does still?). I use it all the time. It’s also a very lightweight .doc and .docx viewer. Programmers really are going to want BBEdit. People rave about it. it’s v. its … Please proofread. Is there an option or an app for the Mac for a .LOG in the first line of the file, that automatically saves the date and time, every time, upon saving, closing and reopening? Or an alternate file, text editor, or app that serves this purpose? Not just the Date/Time modified, but every iteration of closing and reopening within the same document or text file. Oh, disregard this posting if I knew how to retracted I would. I found it and text wrangler. I’d also like to be able to set .log files like this, I used these a lot on windows notepad.